We're sorry, there are no downloads available at this time. The Linksys SFE2000P is optimized for maximizing the system availability with fully redundant Stacking, Redundant Power options, and Dual Images for resilient firmware upgrades. The Linksys SFE2000P is able to secure the network through IEEE 802.1Q VLANs, IEEE 802.1X port authentication, Access Control Lists ACL, DOS Prevention, and MAC-based filtering. The enhanced QoS and traffic management features ensure clear and reliable voice and video communications for those using the Linksys SFE2000P. For Wireless or VoIP deployments, the Linksys SFE2000P supports the IEEE802.3af standard for Power over Ethernet PoE. With automatic load sensing, the power control circuitry automatically detects PoE on the end-device before providing power. For safety, each of the SFE2000P ports has independent overload and short-circuit protection, along with LED indicators for power status. A maximum of 15.4W is available on the FE ports for powering PoE enabled wireless AP or VoIP handsets, with a maximum per device PoE delivery of 185 Watts available for all ports. Linksys SFE2000P switches provide an intuitive, secure management interface enabling you to better utilize the comprehensive feature-set of the SFE2000P, resulting in a better optimized, more secure network. 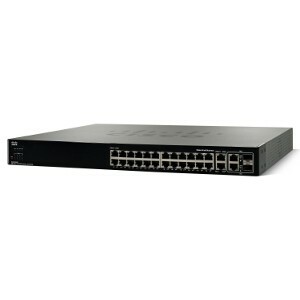 Linksys Business Series SFE and SGE Stackable switch products are Linksys One Ready. That means they include the necessary firmware to be seamlessly integrated into a Linksys One data or data/voice network. Once connected, a Linksys One Service Router will discover the SFE/SGE device, automatically configure it and make it available to other users on the network. Linksys One technology is automatic and self-configuring. When Linksys One Voice Gateways, IP Phones and other Linksys One peripherals are connected to a Linksys One Ready Ethernet switch's ports, small businesses are ready to communicate in a matter of minutes.